Our instructional kitchen provides a classrooms setting for a variety of hands-on cooking classes tought be experienced professional chefs. All classes include learning how to prepare healthy menu items, as well as sampling creations. 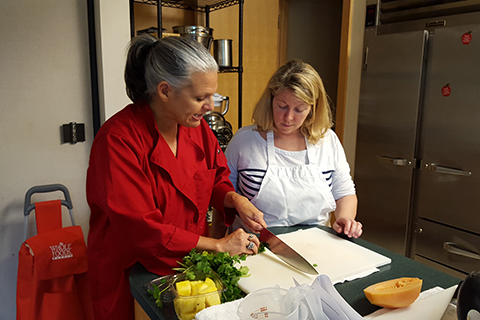 The classes will introduce recipe stations, ingredients, and equipment and will allow participants to explore new recipes with the help and guidance of the chef. Come enjoy this culinary experience and share your techniques and cooking experience with friends. We are currently not offering Community Cooking classes this semester. To book a private class, contact Christina WooChing for more information. Visit our Membership Portal to register for any of our cooking classes. Note: *Receive 20% the second class when you purchase both classes of the 2-part series. Single classes are available at the “Single Classes” rates listed above. You must register for the second class over the phone or in-person at the sales office to receive the discount. Cooking is an essential part of being an adult, but it doesn't have to be a chore. We are excited to introduce Andreu Silverman, current UM Student and chef, who is eager to share his skills with students and teach them, how to prepare delicious dishes on college student's budget and schedule. These classes are designed with college students in mind and are offered exclusively to students. To register for a College Survival Cooking class, visit our membership portal. Interested in holding a private cooking class for a group of friends or special event? Student organizations, University of Miami departments, and non-UM affiliated community members are welcome to schedule a private cooking class for their group. Groups work directly with a chef to select their menu. Price varies based on the number of participants, duration of the class, food costs, and UM affiliation status. Contact Christina WooChing for more information. Note: The Instructional Kitchen is closed during the summer months (June-August). Kitchen space is not available for use by outside chefs.